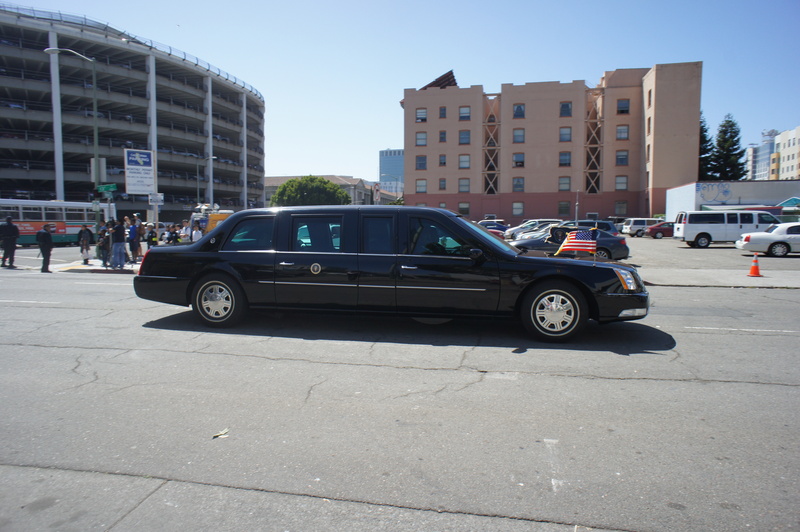 President Barack Obama Comes To Oakland. Hello Mr. President. Welcome to Oakland. As a student at Howard University, I spent five years in the Nation’s capital. A Presidential parade was nothing new to me. Although the eyes of the Nation were focused on my hometown, I was more concerned with simply going home. If I pass this test I can graduate undergrad. If I graduate undergrad, I can start grad school. When I finish grad school, as a professional journalist with a teacher’s degree, I will be able to access and allocate resources that we all can use to better our community. In the grand scheme of things the, Presidential election does matter. I know it does. Do I have any voice in that matter- honestly, I don’t know. I know- 1 vote, 1 person. I know the electoral college. I know that large “Political Action Committees” are BIG sponsors of campaigns. I also understand that there is a lot that I don’t know. But I’ve only seen that via media. And I don’t always believe the media… especially media about the government. In September of 2008, I was in Denver for the Democratic National Convention. In November of 2008 when the news was announced that Senator Obama had been elected as President of the United States of America, I was on Howard University’s campus in Washington DC. I was even in Nation’s Capital on the frosty morning of January 20, 2009 during the inaugural celebration of America’s first African-American President. I saw it. I didn’t understand it. But I saw it. Look man, I’m coming from Oakland, Ca. A place where people have seen the underhandedness of local governing bodies time and time again. In the past four years- we’ve seen blatant dirt on the hands of the State (CA budget) , the City (Police), and even the Transit cops (Oscar Grant). To think that the Federal Government- will do something to better the situation in our Oakland neighborhood is behooving, farfetched, and unrealistic to many of us out here. On the same morning that the Federal forces made a move to close Oakland’s famed medical marijuana college… a mass shooting occurred at Oikos University, a small Christian school located in East Oakland. Unfortunately fittingly. There are people in this city struggling to make ends meet, losing lives to gun violence (with both policemen and black/brown men behind the trigger), and people who have been scarred by the woes of the world. These are the people who don’t trust in the government. On any level. The 99%er movement, which swept the Nation in October/ November of 2011, took to a different feel here in Oakland. Protesters of all backgrounds combined forces and claimed residency right under Oakland’s main tree- in the center of the city. The local governing officials didn’t take too kind it’s new neighbors, and eventually gave them an eviction notice… in the form of a sunrise police raid. The raid set off a domino effect of rebellious actions on the part of the people- and eventually ended with many reports condemning the City of Oakland’s approach to the Occupy situation. The remnants of this movement are still felt locally, as spray paint still adorns the side local businesses and the grass on the City of Oakland lawn is still patchy and brown. Nationally, the Occupy Movement in Oakland is still ringing bells, hence this NY Times Article published on Aug 1st, 2012. President Obama’s late July appearance in Oakland was greeted by protesters… per usual. Many of the protesters were fighting global injustices, federal wrong-doings, and for the legalization of medical marijuana… And some protesters were just out there to protest, as many do in this city. 1. An investigation was ongoing after a weekend shooting in East Oakland left a 5-year old girl in the hospital. 2. A two-day incident, which initially began as a high speed chase and eventually concluded in a house in East Oakland where a standoff between armed men and police lasted 12 hours. 3. The family of Alan Blueford, a teenager who was shot by OPD, filed a federal civil rights lawsuit against the City of Oakland. Blueford was killed on May 6th. The officer who shot, also shot himself in the foot. The officer’s name has not been released, neither has Blueford’s autopsy records. Therefore, the family cannot move forward with this case. These are the problems that haunt this town. Local issues. These are the issues I find myself concerned with. Local issues … not National issues. The people of my city are children who have been hurt by miscellaneous happenings, sisters who have been scarred by society, and people… hurt people. Just imagine: If cured, what wonders could these people do to change society? One week after President Obama’s visit to Oakland, an article about the nature and nurture of Black men in Oakland was published in a local newspaper. The very next day, the NY Times again chose to shine light on America’s new tourist attraction: Oakland, Ca. How can we open our doors to the world, if our house isn’t clean? What is the significance of President Obama leaving the white house, to come to a town where Black and Brown people die in the street- before and after he leaves? I- a young man who watched the 2008 Presidential election process with a lazy eye, a young man who has watched the little (if any) “change” in my local neighborhood with a hawk’s eye, and a young man who is going to the University of California’s graduate school of journalism this fall… I have a responsibility. Outside of individual donors, the University of California Berkeley was noted as the biggest contributor to Barack Obama’s 2008 Presidential campaign, and the Golden Bears are among the leading contributors to President Obama’s 2012 campaign thus far. I need to pay more attention to the connection between the local issues and the federal/ National implications of these issues…For my voice does matter. And, if I can take it upon myself to broaden my focus, I’m sure the people in power locally can take their mind off of federal/ national issues to deal with hometown matters. I’d be willing to make a deal. My curbside treehouse was prime real estate for these ruminations. I emerged from my thoughts just in time to take a photo of the Presidential parade as they made their way through the East Bay. Ten minutes passed, Presidential Lincolns passed. Remaining true to their word- the officers then said I could pass. I went home, urinated, and studied some more. I’ve got a class to pass.